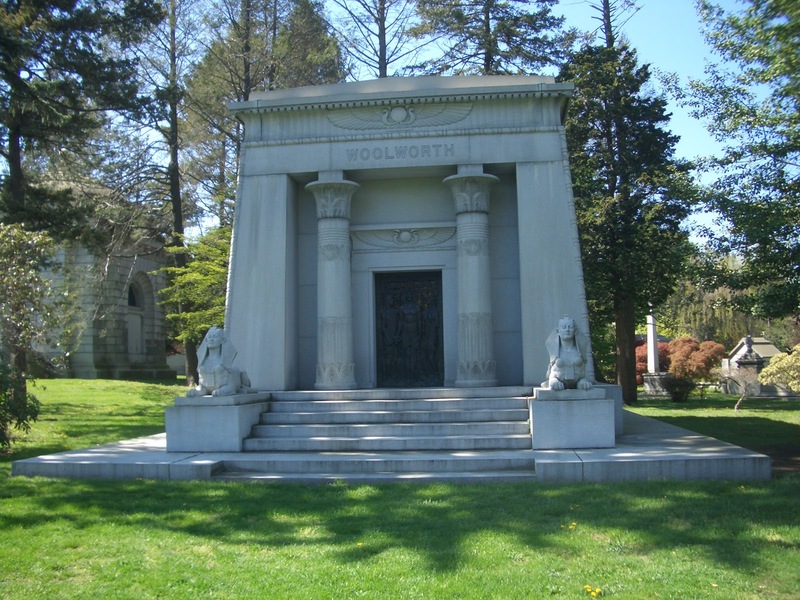 Woolworth founder, Frank Winfield Woolworth, is entombed within this imposing, Egyptian-themed mausoleum in Woodlawn Cemetery. Designed by architect John Russell Pope -- whose designs also include The Jefferson Memorial and the National Archives and Records Administration --the Woolworth mausoleum boasts twin guardian sphinxes, Egyptian carvings, papyrus-styled columns and Bronze doors with figures exchanging an ankh (the Egyptian symbol for life). In 1879, Woolworth opened his first “Five and Ten Cent Store” in Utica, NY. Although that store soon failed, his second store, opened later that year, and located in Lancaster PA , was a rousing success. Over the years, more than a thousand F. W. Woolworth Company locations opened around the world. Woolworth died suddenly, in 1919, at the age of 66, in Winfield Hall, his Long Island mansion. Initially, his estate was estimated to be $65,000,000. That amount was later reported to be just under $30,000,000. The Woolworth Building, the former corporate headquarters of the Woolworth Co., was once the tallest building in the world and is both a National Historic Landmark and a New York City Landmark. It has been said that a cemetery is probably the most peaceful spot in any city. Some built beautiful graveyards for their love ones believing that the grave serves as their permanent home and that the dead deserves it. I surely believe that cemeteries are places of serenity, beauty and continued connections. What's more, there is so much to learn from a cemetery visit.